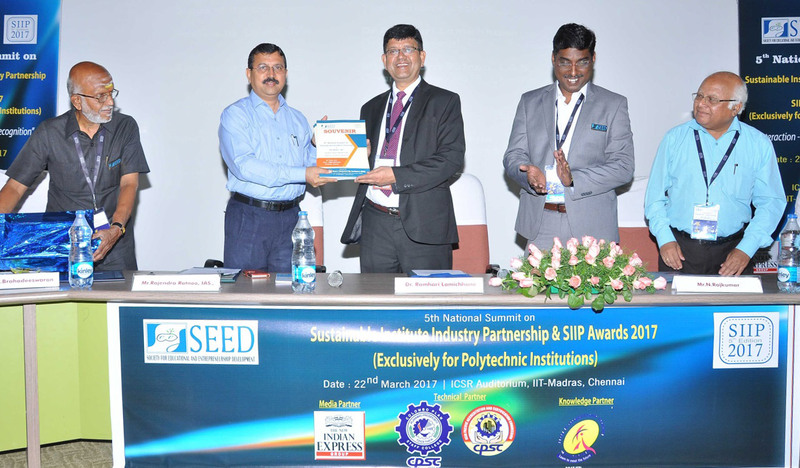 The Colombo Plan Staff College was involved as a technical partner of the Society for Education and Entrepreneurship Development (SEED) in the 5th National Summit on Sustainable Institute and Industry Partnership (SIIP), held at the ICSR Auditorium in the Indian Institute of Technology (IIT) in Chennai, India on March 22, 2017. This annual gathering invited representatives of polytechnic and higher education institutions in India and in other countries to tackle the industry-institute gap through cooperation and information exchange particularly on institutional opportunities that promote the development of their students. e Society for Education and Entrepreneurship Development (SEED) is an organization which was established by professionals with rich experience in industry, academia and entrepreneurship. Its mandate is to provide training programs for the academe and industries, facilitate quality assurance through accreditation, promote industry-institute partnership, establish linkages, strengthen entrepreneurship and undertake research and development projects for the benefit of Indian polytechnic institutes and other educational facilities. Mr. Rajendra Ratnoo, I.A.S., Commissioner of Technical Education, Directorate of Technical Education (DoTE), Tamil Nadu, India handing over the Proceedings of the Conference to Dr. Lamichhane The Director General Dr. Ramhari Lamichhane, was invited as one of the Chief Guests of the program, alongside the Commissioner of Technical Education, Directorate of Technical Education (DoTE), Tamil Nadu, Mr. Rajendra Ratnoo. I.A.S. Dr. Lamichhane is accompanied by CPSC’s Faculty Consultant, Prof. Dr. G. Kulanthaivel. In his special message as chief guest, Dr. Lamichhane mentioned that "TVET performs an important task to make opportunities available for people to learn not only the skills and knowledge but as well as the attitude required in the labor market, which oftentimes are not offered by the general education system". He also affirmed the role of the Asia-Pacific Accreditation and Certification Commission (APACC) in facilitating the rapid changes in the labor market in the region and its potential to contribute to the quality advocacy of Indian TVET polytechnics. He also added that APACC promotes the importance of quality assurance and molds the graduates and institutions to adopt regionally-accepted standards that will enable them to be accepted in any country across the region. This year’s conference revolved on three themes: First is focused on improving the employability framework through SIIP which discussed curriculum development, skills enhancement, staff exchange, industrial projects, accreditation, survey and rankings. The second theme focuses on tackling the ways to promote inclusive growth by enhancing alumni involvement, student’s job placement, entrepreneurship and internship. The last theme collected the best practices and initiatives of the invited speakers representing their own institutions or organizations. Dr. Kulanthaivel presented a paper under the first theme entitled the "Education Excellence of TVET Institutions through APACC Certification" which tackled the role of accrediting bodies such as APACC in promoting labor mobility and quality assurance. During the program, Dr. Lamichhane also presented the SIIP awards to some of the notable persons and institutions. He also extended his felicitations to the recipients for their achievements. In his closing remarks, he highlighted the importance of industries involvement in TVET pre-program to post-program stage and expressed CPSC’s commitment to further contribute in the progress of TVET in the region. Prof. Dr. G. Kulanthaivel delivered the paper during the Session on "Improving the Employability Framework through SIIP – Curriculum development, Skill enhancement, Staff Exchange, Industrial Projects, Accreditation, Survey & Rankings"